Rev. 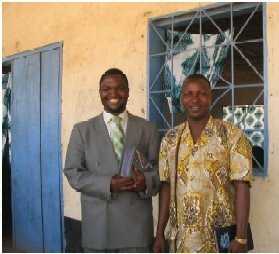 John Phiri from the Reformed Church of Zambia is the leader of the Christian Reformed Church (CRC) in Sierra Leone. Christian Reformed World Missions and the Zambian Reformed Church are partners in an amazing ministry that includes evangelism, agriculture, leadership training for local pastors, micro-credit programs, women’s ministry, and youth ministry. In 1979 the Christian Reformed Church in North America committed to help one of the poorest African countries: Sierra Leone. Christian Reformed World Missions (CRWM) and the Christian Reformed World Relief Committee (CRWRC) started their work in Sierra Leone that same year. Civil war from 1991-2002 resulted in the deaths of more than 100,000 citizens and destroyed the physical infrastructure of the mission project. Missionaries and local Sierra Leonean staff stayed throughout the war. They helped with rescue efforts, refugee camps, trauma healing, and peacemaking. Their solidarity with the local people throughout the war was a tremendous witness to the compassion of Christ, and the church began to grow. In 2005, Rev. John Phiri from the Reformed Church of Zambia was recruited to lead the ministry in Sierra Leone. CRWM and the Zambian Reformed Church are now partners in this amazing ministry. With God’s guidance and blessing, John and his team have built on a strong foundation and achieved wonderful results. While there were no churches in this area in 1980, by 2004 there were 18 churches with 1,100 people attending weekly, and by 2011 there were 62 churches with a total weekly attendance of 6,000 people. The Holy Spirit has led the team into many new villages in Muslim areas, and the teachings of Jesus are changing the minds of many people. The church is involved in evangelism, agriculture, leadership training for local pastors, micro-credit programs, women’s ministry, and youth ministry.